My family and I just moved into a townhouse, it's very nice, however my sister is extremely picky about noise and the walls in our townhouse seem to be pretty thin and you can hear almost anything through the vents. My Mother and I tend to stay up later but my sister is a very light sleeper and she wakes up to any noise she hears so we don't feel like we have the freedom to be able to talk or watch TV or anything at night because it disturbs my sister so I decided to do some research and see if we could soundproof her room or at least alleviate the amount of noise she can hear in her room. My mother is renting the townhouse so we can't make any permanent changes to the house. Are there any products that we can put in the vents or put in her room that may help block out some of the noise she hears or absorb some of the sound? Hello, <br>My family and I just moved into a townhouse, it&#39;s very nice, however my sister is extremely picky about noise and the walls in our townhouse seem to be pretty thin and you can hear almost anything through the vents. My Mother and I tend to stay up later but my sister is a very light sleeper and she wakes up to any noise she hears so we don&#39;t feel like we have the freedom to be able to talk or watch TV or anything at night because it disturbs my sister so I decided to do some research and see if we could soundproof her room or at least alleviate the amount of noise she can hear in her room. My mother is renting the townhouse so we can&#39;t make any permanent changes to the house. Are there any products that we can put in the vents or put in her room that may help block out some of the noise she hears or absorb some of the sound? <br>Thank you for your help!!! Putting anything in or over vents to reduce noise transmission is going to reduce air flow through the ducts. Generally speaking "soft" things absorb sound so a carpeted room will be "quieter" than one with hardwood flooring but there really isn't a "cheap" solution. I might suggest a white noise generator (machine) to help mask the sounds. Hello clf68. Welcome to the Community! 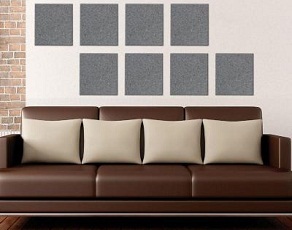 As Adam444 has said, soft items like fabric wall hangings, area rugs and carpeting or even sound insulation panels that can be wall mounted will help. Typically if you want to deaden noise it would be done by treating the inside of walls using sound absorbing insulation. I understand that is not feasible for you. Sound traveling through ducts will be harder to reduce. The only way I know would be to shut off the duct completely, and in addition placing something like a blanket over the register as well. This may not be a popular solution either. I do like the white noise generator as a "quiet" distraction though. Might be worth a try. Also consider the possibility of moving furniture around to minimize sound transmission. Can the TV be moved to another wall farther away? How about moving the bed in your sisters room to be farther from the TV room? Welcome to the community! There are a number of products that can be used to better insulate a room from sound transmission. However since the home is being rented and structural impact needs to be kept to a minimum the first place to look at is the bedroom door. Hollow core doors (the most common doors within a home) do very little to stop sound transmission. Adding foam weather stripping around the door to better seal it from air and light transmission will have the added benefit of helping to reduce sound transmission. Once inside the room acoustic absorbing materials can be added to the walls adjacent to the homes living areas. These items can range anywhere from large sheets of insulation material or panels which can be arranged in a more aesthetically pleasing way as seen with the acoustic panels below. Going a more DIY route hanging things like heavy quilts or even placing a bookshelf along the bedroom wall shared with the living area can help reduce sound transmission. Having your sister play relaxing music playing at a low level while she sleeps can help make her less aware of stray noises from outside of the room. I hope this helps and if we can help further be sure to let us know.